Another wonderful chapter to add to Y&T’s glorious legacy. 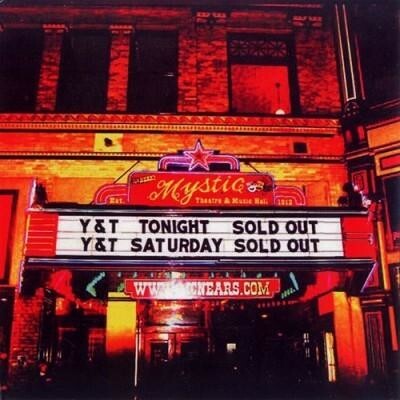 ‘Live At The Mystic’ represents Brad Lang’s first Y&T recording after he stood in for the ailing and now much missed Phil Kennemore and is Y&T’s third live release (not counting the BBC archived releases) after 1985’s terrific ‘Open Fire’ and 1991’s blistering ‘Yesterday & Today’. Only three songs survive from ‘Open Fire’ – the awesomely emotive ‘I Believe In You’, the sizzling firecracker ‘Rescue Me’ and the fantastically anthemic ‘Forever’, whilst basically half of the thirteen tracks from ‘Yesterday & Today’ make it onto ‘Live At The Mystic’ – ‘Meanstreak’, ‘Hurricane’, ‘Winds Of Change’, ‘Black Tiger’, ‘I Believe In You’, ‘Squeeze’ (sung by John Nymann) and ‘Forever’. Recorded at San Francisco’s legendary Mystic Theatre & Music Hall on November 18th and 19th 2011, it showcases a band that can put much younger acts to shame with their energy, enthusiasm and capacity to go that extra mile to give the fans an absolutely unforgettable show and more bang for your buck that other bands with the same longevity and standing in the rock world would do well to heed and follow. I don’t know of any current professional band that plays for well over two hours, and yet still plays the last song of the set as though it were their first. 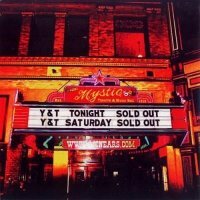 Y&T are absolutely unique in this respect and that’s why you’ll find packed out shows wherever Y&T play. Dave typically plays extended solos on the groove-laden ‘Dirty Girl’, the beautiful ballad ‘Winds Of Change’ and the previously mentioned ‘I Believe In You’. Interestingly there is nothing from the first two Yesterday And Today albums played on this recording despite ’25 Hours A Day’ and ‘Struck Down’ still making it into their live set from time to time. Six songs from 1981’s ‘Earthshaker’ when they abbreviated their name to Y&T have made it though as it was the 30th anniversary of that record plus four from 1982’s ‘Black Tiger’ but with no ‘Barroom Boogie’ this time. Only two from ‘Meanstreak’ and ‘Ten’ respectively as surprisingly their biggest hit ‘Summertime Girls’ from the criminally overlooked ‘Down For The Count’ has made way for seven cuts (if you include ‘Prelude’) from their ‘comeback’ album ‘Facemelter’. Superbly Engineered and mixed by Dave and Tom Size with mastering by Ken Lee this is another wonderful chapter to add to Y&T’s glorious legacy.